Don't be a square...flap. Did you get it? Because we have a lot of square flap envelopes? ... Instead, use something different with these awesome 5 5/8 x 7 3/4 V-Flap Envelopes! You can send them and forget them knowing your most important letters and cards are riding in style. The White and Ivory color match with any kind of occasion, whether it's for a wedding invitation, a christmas blessing, a professional note, etc. You can't go wrong with these two colors. And the deep v-flap makes for a super modern finish, allowing your recipient's to nod their head, impressed by not only the 5.635 x 7.75 closeout envelope size, but also features that come along wiht it. Note - these envelopse do not have GUM! 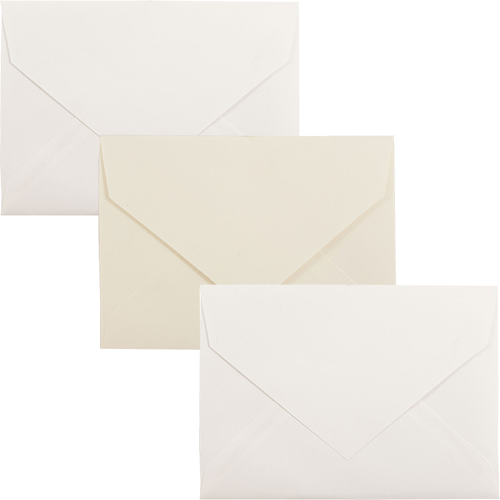 5 5/8 x 7 3/4 V-Flap Closeout Envelopes are only sold by the thousand which means more savings for you and better envelopes too! Don't miss out on this awesome deal. But you have to hurry and get them while supplies last! These are called closeout for a reason you know!